You've got your daily skin care routine: wash, dry and you're done. You might throw on some lotion if your face is really dry. But that's just not enough. Maybe your skin still feels oily after you wash it, or you wish your skin and pores could be a little tighter. 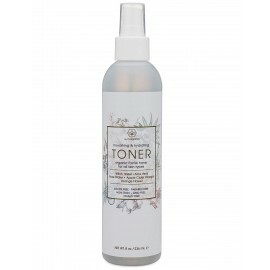 Adding a skin toner to your daily regimen might be the perfect solution. Feel Fresh With Every Spary Of Sri Sri Tattva Gulab Jal (Rose Water). Boosted With The Richness Of R..
Khadi Herbal Rose Water is a natural moisturizer imparts glamour & glow to the skin of all..
Khadi Pure Gramodyog™ Herbal Cucumber Water makes amazing skin freshener with honey, cucumber ..
Neev Organic Rose Water, 50mlDescriptionHelps Maintain skins pH balance, natural cleanser, h..
Khadi Pure Gramodyog™ Herbal Rose Water is a natural moisturizer imparts glamour & glow to the s..
PropertiesWeight128 (gms)Dimensions3.5 (cm) x 3.5 (cm) x 15 (cm)..
Contents1 Bottle of 200 ml of Lass Naturals Rose Water D..
PropertiesWeight176 (gms)Dimensions4 (cm) x 4 (cm) x 17.7 (cm)..
Lass Naturals Cucumber Mint Freshener & Toner 100ml DescriptionLass M..
Neev Organic Rose Water, 100mlDescriptionHelps Maintain skins pH balance, natural cleanser, ..
1 Pcs - Khadi Pure Herbal Cucumber Water - 210ml, 1 Pcs - Khadi Pure Herbal Rose Water - 210ml ..
Vagad`s Khadi Natural Rose Water removes pollutants and impurities from skin. It also helpful to coo..
Lass Naturals Spring Mist Freshener & Toner 100mlDescriptionLass Spring Mist has been sp..
Acne Control Skin Tonner Sage Herbals Acne Control Deep Radiance Skin Tonic is an ideal owing to soo..
Rose water is undoubtedly beauty's magic potion, and remarkably versatile. Whether you have oily, dr.. Ancient Living ROSE WATER 100mlAncient Living Rose water is collected as a residue during the es..
Organic Therapie REVITALIZING Toner 50 mlDescriptionOrganic Therapie Revitalizing Ton..
Fuschia Lavender Face and Body Mist infused with lavender essential oil reduce stress with its herba.. This Rose infused water mist is a wonderful facial toner and natural astringent, balances and restor.. Eliminates excess sebum, dirt and impurities Makes skin whiter & brighter Leaves skin s..
BEAUTIFUL SKIN FOR ALL AGESBENEFITSGives glowing skin Gives the fresh look to your skin..
Neev Apple Cider Vinegar Facial Spray, 50 mlDescription Makes skin smoother, tones facial skin,..
Neev Organic Rose Water Spray, 50mlDescriptionGreat Cleanser and skin toner, aids in r..